World Routes Academy 2012 protégé José Hernando visits Colombia to work with his mentor, celebrated accordionist Egidio Cuadrado. World Routes Academy 2012 protégé José Hernando visits Colombia to work with his mentor, celebrated accordionist Egidio Cuadrado. He is also invited to join a session with one of Colombia biggest stars, singer Carlos Vives, and he gets a chance to record one of his own songs in a Bogota studio. With Juan Carlos Jaramillo and Lucy Duran. 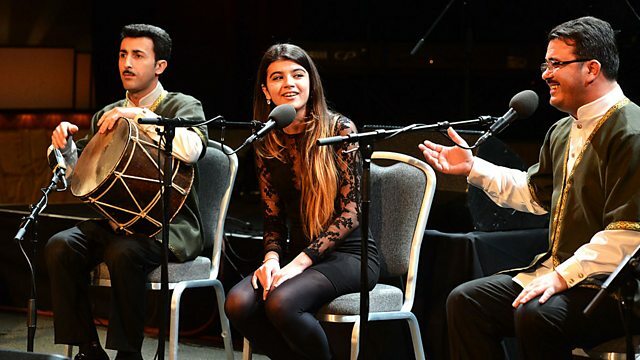 Launched in 2010, the BBC Radio 3 World Routes Academy aims to support and inspire UK based young world music artists by bringing them together with an internationally renowned artist in the same field and belonging to the same tradition. The scheme targets forms of music and musical skills that are under threat to help preserve them. Born in London but of Colombian descent, the talented young José Hernando fell in love with Vallenato, the popular folk style from the Caribbean coast of Colombia, which he learned from watching clips online and on tapes his father brought back from Colombia. José Hernando plays in a number of Vallenato and Cumbia folk bands in London and is the musical director of Revolucion Vallenata, a multi-cultural band celebrating the Vallenato tradition. José Hernando is also currently studying for a degree in Guitar at the Tech Music School in West London. For the BBC Radio 3 World Routes Academy 2012, José is paired with Egidio Cuadrado, the gifted Colombian accordion player, perhaps best known for his work with Carlos Vives, the Grammy-winning Colombian star and one of the most celebrated performers in Latin America.